Heinz Rögner was one among many fine conductors working extensively in the former East Germany whose recorded work flew beneath the radar of Anglophone listeners, whether through lack of exposure to their work in the concert hall, lack of international PR, or plain snobbery and political prejudice. But if the name suggests stolid pig farmer more than commanding maestro, the interpretations, of Bruckner in particular, revealed a subtle and dynamic musician schooled in the old ways of rigour but not bound to their traditions. Born in Leipzig in 1929, he took over the city's 'second' orchestra at the age of 29, and then in 1973 began a 20-year stint at the head of a similarly overshadowed body, the Berlin Radio Symphony Orchestra (formerly the RIAS Symphonie-orchester Berlin, now DSO Berlin). 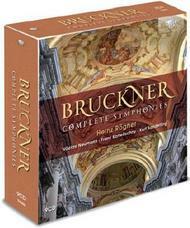 These recordings of Bruckner's mature symphonies, never before collected in a single set, are marked by their comparative swiftness and clarity of texture at a time, in the post-war era, when Bruckner was a byword for expansive, hymn-like solidity: these are not the 'cathedrals in sound' of yore but more secularly conceived solutions to the 'problem' of the symphony with which Bruckner wrestled all his professional life. Here they are complemented, to form a complete set of the numbered symphonies, by recordings similar in spirit led by three other conductors whose work in the Eastern bloc was remarkable for its consistency and impassioned precision - the Czech Václav Neumann, the Russian Kurt Sanderling and the Moravian-born Franz Konwitschny.